The sunken ancient merchant ship Nan'ao No 1, which is being salvaged off Shantou in South China's Guangdong Province, may have been involved in arms smuggling before it sunk. Piles of copper plates, some of them 60 cm in diameter, and copper coins were found on the vessel. There was a prohibition on exporting copper during the period of the ship's operation in the late Ming Dynasty (AD 1368-1644), Guangzhou Daily reported on Sunday. "Even if they were not smuggled, they were carried secretly. The ban on the exportation of copper was actually exerted as early as the Song Dynasty (AD 960-1279) and became stricter under the Ming Dynasty Emperor Wan Li," Sun Jian, director of the salvage team from the National Underwater Cultural Heritage Protection Center, was quoted as saying. Archaeologists have yet to determine whether the copper plates are finished products or raw material, because they became joined together after spending hundreds of years under water, Sun said. Whichever the case may be, it was highly profitable to export copper at the time, he said. In the Ming Dynasty, the standard currency system was silver, which could be exchanged for a large amount of copper. Copper guns and canons were also discovered on the sunken ship. This was not uncommon on ocean-faring merchant vessels at the time, Sun said. 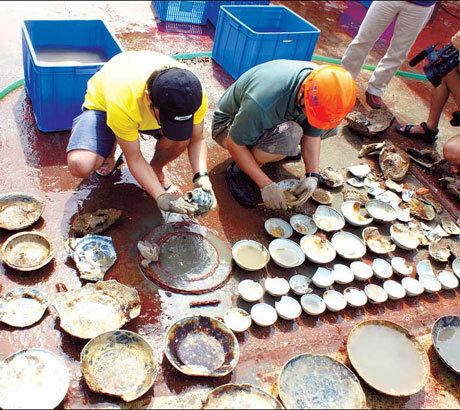 Nearly 1,000 relics have been found on Nan'ao No 1 since salvage work resumed last month after a six-month suspension due to unfavorable weather conditions.